Our all-volunteer Board of Directors is a remarkable group of people who set the vision for Breast Cancer Action and lead the organization by determining organizational policy, assuring the organization’s financial security, and representing Breast Cancer Action’s views to the world at large. In January 2018, we welcomed Amy G. Cho to our Board of Directors and are excited to introduce you to her here. For information about our Board of Directors, click here. Amy G. Cho, MSCS, SPM, is a native of the San Francisco Bay Area and has worked in the tech industry for more than 10 years across enterprise, startup, and homegrown companies. Her roles have included software engineer, product strategist, adviser, and entrepreneur. Much of her work involves leveraging technology to advance social justice causes. She is currently a startup adviser for the edtech company Qalaxia, which connects mentors to classrooms on a charitable learning platform. More recently, she is bringing her technical leadership skills to HireKind, a company focused on boosting diversity and inclusion in the tech sector. She holds a Bachelor of Science and Master of Science in Computer Science from San Jose State University. Amy was drawn to Breast Cancer Action’s strong mission to uproot breast cancer at the systemic level. She was inspired to see firsthand how the organization, powered by its dedicated staff and board, support the community and each other by providing practical education, thoughtful programs, and a fearless voice. Amy’s mother and maternal grandmother both live with breast cancer. 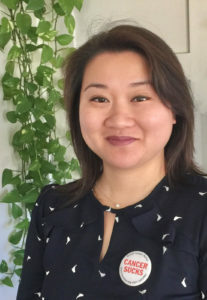 Most of all, Amy is honored to represent her immigrant Chinese-American family and share their experiences with breast cancer with Breast Cancer Action. She believes that addressing the issues of underrepresented communities, which are disproportionately affected by breast cancer, is an important piece of the puzzle in the fight for systemic solutions and true system change that will address and end the breast cancer epidemic.